Internet radio pioneer Tim Westergren is working on a DIY touring program for musicians. An ongoing experiment at free streaming radio service Pandora, the artist touring program could "solve the singular problem of musicians: how do you get people to come hear you play?" 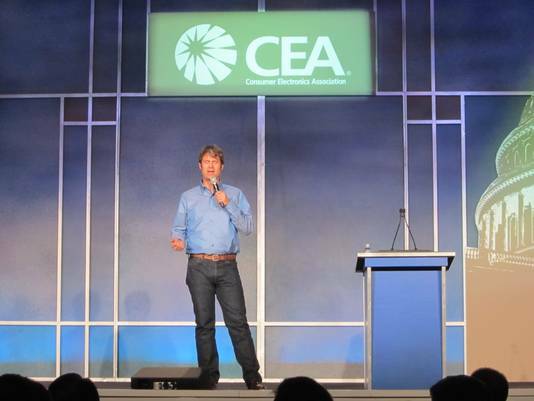 said Pandora founder Westergren, speaking Wednesday night at the International Consumer Electronics Show. Pandora, which grew out of the Music Genome Project started in 2000, has all the relevant data for an artist to plan a tour schedule. Listeners click "thumbs up" icons when they hear music they like when listening to the free service. 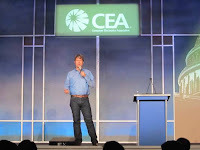 "We have 22 billion pieces of thumb feedback on Pandora," Westergren days. "So we essentially know where the audience is in the U.S."
An idea that Pandora is "cooking up," he says, is giving artists the ability to log in and see a map that shows "where their thumbs-ups are." Bands could plot tour schedules that would hit their "thumbs-up zones" and "then, with a click of a button, log out, get in the van and drive to those cities," Westergren says. "Their listeners will be alerted a couple weeks before they get to those locations … that this band is coming and have one-click ability to buy tickets." Westergren didn't offer a timeframe for possible availability of the service. However, he said that such a service, combined with the growing Pandora listening audience – it had 67 million active listeners in December 2012, up 41% from last year – could boost the music ecosystem. "Put that together with a robust radio and we have the makings of real exciting healthy, profitable and growing music industry," he said.